We were so excited to spend time on Carlisle Beach, which is said to be one of the prettiest beaches in Bridgetown. Yes, the water was beautiful and the sand was warm and white. This beach made our worst beaches list because of the drug deal we watched between a local cop and a member of the military just a few yards from our beach towels. As soon as they noticed our onlooker presence, we were out of there! The idea of drug-dealing men wielding machine guns and badges was enough to send us running away from the shore without looking back. Prior to going to San Juan, we had been warned many times about safety, especially at night on the beaches. The first day of our arrival, we were so excited to spend time crashing through the waves and soaking up the sun on the beautiful beach at our hotel. And, after the 14 hour, red-eye flight it was totally worth it. But, as soon as the sun went down, armed guards boarded off the entrances onto the beach and stood watch over the area until sun up. Apparently, the beaches of Old San Juan at night are a popular place to add to the area’s skyrocketing murder rates. Yikes! The portion of Seven Mile Beach just outside of Margaritaville made our list because of the limited area guests are given to swim and relax in. Inside this super small, roped-off area, which is crammed full of people at times, there’s a few inflatables you can crawl on and jump off of to pass a little time. However, you must exercise caution as to not jump onto the people waiting for their turn. The second people are done, a few young locals relentlessly try getting money, literally following people onto their tour boats. And, if you even glance outside of the small roped off area, you’ll be approached from all angles to buy drugs from one of the many paddle boarders who surround the area like sharks. It doesn’t make for the most fun environment to hang out in. 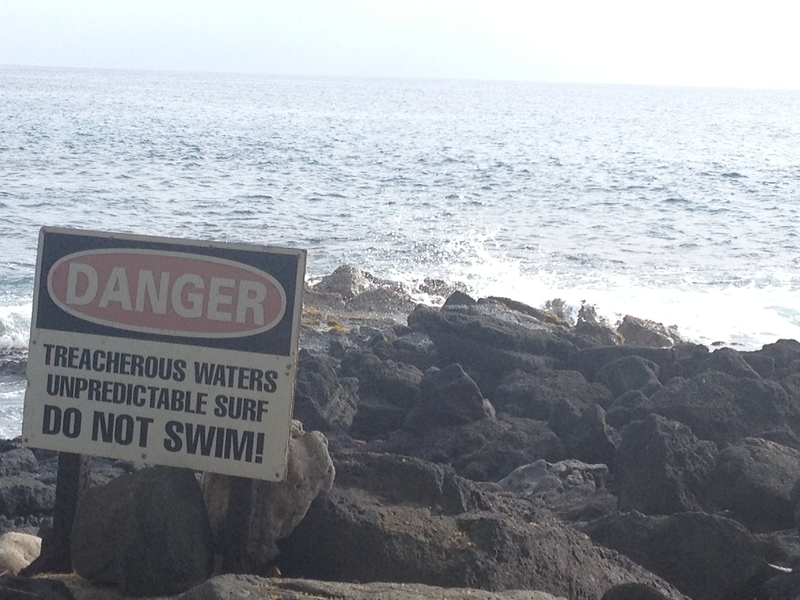 The beaches immediately surrounding Kona are not beaches at all. Instead, they are made up of sharp black lava rocks and signs that caution against swimming due to treacherous water conditions. Enough said! Want to know what wonderful beaches we do recommend? Stay tuned!!! We have a few treacherous pieces of coastline in Australia too. In fact we have a whole area called the Shipwreck Coast. Can’t wait to make it down that way and check it all out! Hope you do get down our way!